Christopher Charles Hackett was of Irish descent, although born at Liverpool, England. He was the thirteenth son born to Pierce and Mary Edwards Hackett on Christmas Day, 1850. His mother declared that she wanted all boys in her family and apparently her wish was granted. Four of the sons came to America in 1850 to be followed by the remainder of the family the next year. And so the Hackett family of father, mother, and ten sons was reunited, three having died in infancy. The first home in the United States was established at Independence, Missouri. The year following a house was made at Butler, Bates County, of the same state. Pierce Hackett, the father, died in 1858 leaving his widowed wife and ten sons. When the Civil War broke out in 1861, Missouri was more or less a divided state, some of its citizens favoring the North and some the South. This same divided condition prevailed among the boys of the Hackett family, in evidence of which four of the boys joined the Union army and four the Confederate Army. It is not known if they ever opposed each other in the same battles. It is hard to imagine the feelings of the mother under these trying circumstances. Christopher, the subject of this sketch, was too young to enlist. While Christopher was growing to manhood, Missouri was largely a frontier state. Educational opportunities were limited. He, however, had a thirst for learning and attended school often with children years younger than himself. He learned the trades of tailoring and carpentry from his brothers. During the California gold rush, George Hackett, Christopher's brother, and two or three other men set out for the golden state. Arriving in Utah, they camped for a few days' rest at Spanish Fork. One of these days happened to be Sunday. An old lady and her husband passed the camp of the travelers on their way to church. They stopped to talk to the men, asking who they were and where they were going. Then George told them that they were on their way to California, the old lady made this significant statement, "You will never leave this Territory until you go on a mission for the Mormon church." None of these men were Latter-day Saints. In fact they were mostly Mormon-haters. Strange to say, however, it turned out exactly as the old lady predicted. George became converted to the Church, married a Latter-Day Saint girl and made a home at Alpine, Utah, and from that ward went on a mission to Missouri where he converted his mother and youngest brother, Christopher. Upon receiving his release from his missionary labors, George Hackett with his mother returned to his home in Alpine, his brother Christopher following a year and a half later, making his home also at Alpine for the next year. He then obtained work as a tailor in Salt Lake City. Thither he moved, taking his mother with him. 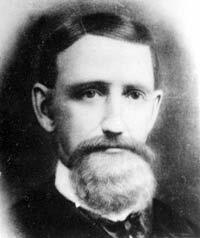 In 1880 he moved to Lehi to operate Mulliner's flour mill at the site of what was later the Lehi Sugar Factory. On his thirty-first birthday anniversary, December 25, 1881 Christopher was married to Margaret Elsie Booth of Alpine by her brother, John Edge Booth. This couple was later sealed, April 19, 1882 in the Salt Lake Endowment House. Their first two children, Edna Myrtle and May were born in Alpine, where Christopher operated a saw mill and worked at carpentry. A move was then made to Wellsville Utah, where he again engaged in flour milling for a period of four years. The family then moved to Rock Springs, Wyoming, remaining for a year and a half while Christopher was employed as a timberman in the coal mines. During these years the family increased apace. It seems as though the Hackett family did not remain in any one place for long. Following the brief stay at Rock Springs, homes were established successively at Provo, Alpine, Arimo, Idaho, Salt Lake City in three different locations, Alpine again, and finally, Lehi. 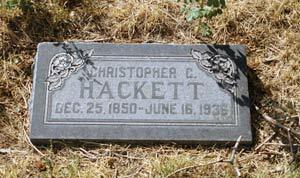 Christopher Hackett was naturally progressive and his life one of activity and usefulness. Seldom do we find a person gifted in so many lines of endeavor, tailoring, carpentry, milling both flour and lumber, farming, merchandising, casket making, and mining. He owned the second automobile and was second to have plumbing in the home in Alpine. He also had the first motor driven washing machine, the first concrete walk and the second piano in this little community. He was willing and dependable as a church worker, holding with honor the following positions: President of the Alpine Y. M. M. I. A., three times; Ward Clerk, Chairman of ward building committee, ward teacher many years, chairman of Alpine Home Dramatic Club, chairman of the Lehi Fifth Ward Genealogical Committee, Secretary of Lehi Stake High Priest's Quorum, Keeper of Lehi baptismal records. He and his wife engaged in much endowment work for the dead. In the fall of 1905 he accepted a call to the North Central States Mission. He left a wife and eight children (with another soon to come) to fill this appointment. The family had very limited means of support. Edna, their oldest daughter, was teaching school. From her meager pay she sent money to her father in the mission field and the rest went to the family, but by dint of great sacrifice, the family survived and the mission was completed. C. C. Hackett was a lover of sports. His special interest was in basketball. He and his four sons issued a challenge to any other family in Alpine to meet them on the basketball court. The Don Strong family accepted the challenge but were easily defeated by the Hacketts. He had the record of attending more state High School basketball tournaments than any other fan. His last years were saddened by the death of his wife to whom he has most devoted. After her passing he declared himself to be "a lone man in a lone world". He could not content himself with the families of any of his children and yet made a poor-out of doing for himself. His unmarried daughter Maude came to his rescue for about the last two years. He died at his home in Lehi the 16th of June 1936. Burial was in the Alpine Cemetery. The children in order of their birth were Edna, May, Maude, Charles, Richard, Allen, Ora, Rulon, Margaret, and Joseph. At this writing (1958), four have passed on: viz., Edna, Maude, Charles, and Richard.